Good news first - Karen did a nice and steady test to add to our team score with a 44. Becky and Comet had a beautiful test and scored a 39.8. There were some amazing scores and tests throughout the day with Michael Jung in the lead on a 33! Phillip was very disappointed with his test. It started off well with some lovely extensions in the trot work and good lateral work. 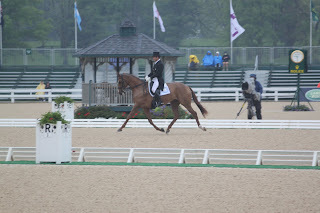 Woodburn's canter can be a bit difficult to hold steady and together and unfortunately after getting 9-9-8 for his medium canter down the long side, Woodburn got tense and switched leads in the corner. Once this mistake was made it was hard to get him back to where he was and the damage was done. His score of 48 could easily have been in the low 40s. However, that is behind us now. As Jan Byyny said "the fat lady has not sung yet". So, we head in to cross country day. I do hope (and pray) that I will have good news to report from all our riders. 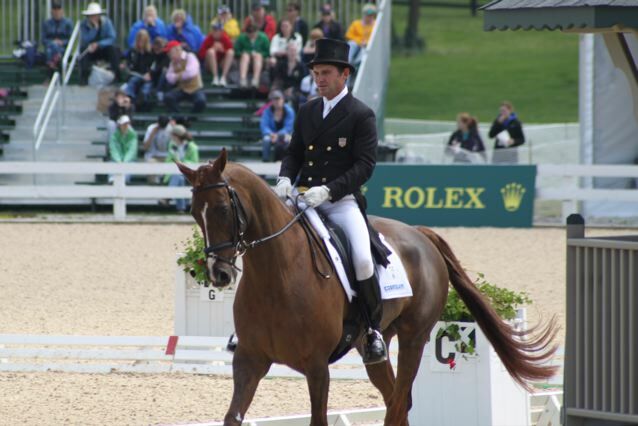 This blog has been about Phillip's road to the WEG - now he is officially there! I will be writing on behalf of Phillip (mainly because he can't type) and more seriously because he has a lot to do! The US team jogged this morning. 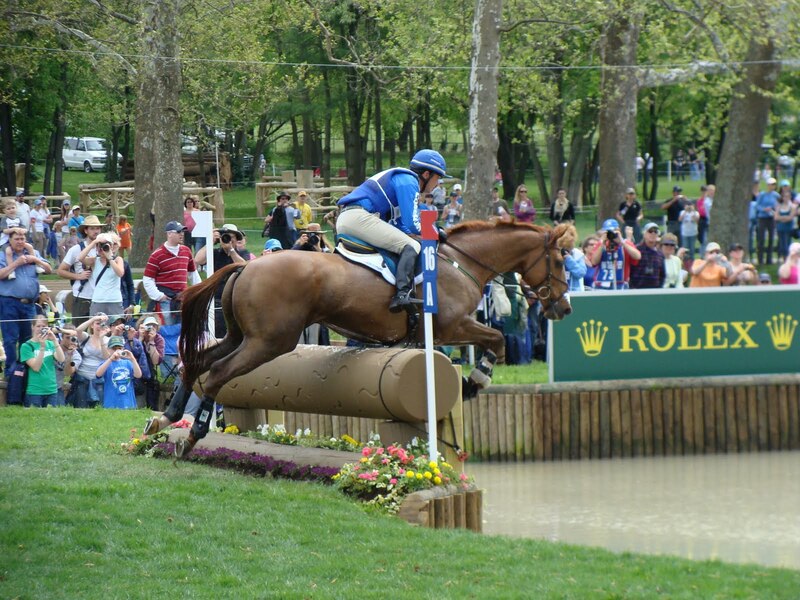 Sadly, Kim Severson had to withdraw her horse. You can't underestimate how tough it is and our hearts go out to Kim and her team. All the other horses jogged well and now it is official - with Kim out it changes the team a bit and Karen will step into the team slot with Mandiba. We walked the course yesterday for the first time and it is BIG! You definitely know you are at a championship when you walk around the track. The head of the lake is quite daunting with a lot to do there. If you can get on to a website to see the pictures it is worthwhile. 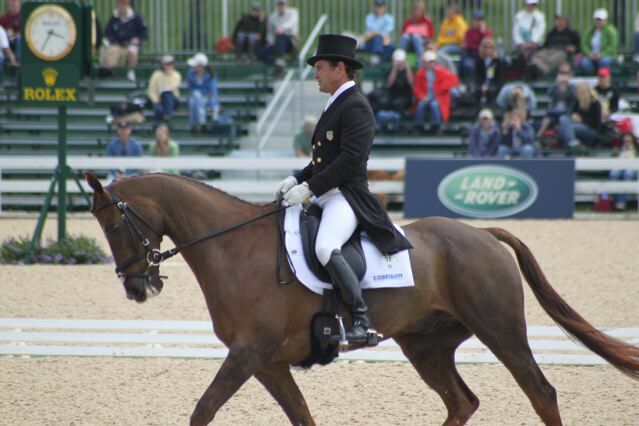 Phillip will do his dressage test on Friday, which seems a long way off, but it will go by quickly. Will keep you updated each day on the team's progress. 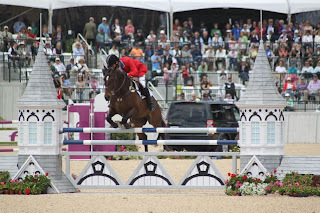 It is the day after the opening ceremonies for the World Equestrian Games. Our team was very patriotically attired in bluejeans, blazers, cowboy boots and hats! It was an amazing spectacle and really gets your blood going that you are at the biggest competition of your life! The Kentucky Horse Park looks amazing and the competitions are well underway with reining and the endurance horses in the midst of competition. Our horses traveled well from Georgia and have all settled into their new home at the Kentucky Horse Park. It is good to get into a bit cooler temperatures for the horses. I have TruLuck here as well stabled off the show grounds, so had to ride him this morning before heading out to the horse park. 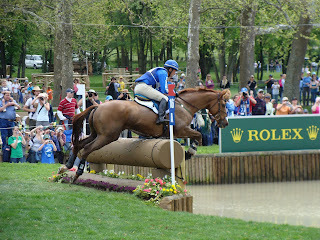 Non competing horses are'nt allowed on the grounds so he is staying at Cathy Weishoffs barn down the road. Tomorrow we work the horses and then on Tuesday we have our briefing and are able to see the course for the first time. Wednesday we have the first trot up at 9:00. Once that starts, I know things will move very quickly, so I will try to keep you posted on how things are going. I hope everyone is crossing all appendages! I returned from my brief visit home on Monday morning. It was really nice to see my parents, see the kids and to attend the final day of the Plantation Field International Horse Trials. This event is our home event and Evie and I have been involved in the organization for the past three years. It is very exciting to see how the event has grown and all the effort put into it by Denis and Bambi Glaccum, Katie Walker, Amy Borun, Colby Saddington, Evie and all the volunteers. I was so pleased for Jennie Brannigan who won the CIC*** class with Nina Gardner's Cambalda. This is a super combination and Jennie has worked really hard bringing this young horse along. Since I was unable to ride, Jennie rode a few of my usual mounts, Vidalia, Paprika and Young Man, producing good scores in all phases. Back to reality and training. Oded Shimoni and Katie Prudent arrived to work with all of us for the past few days. I am very pleased with our progress - there is a lot of detail to work on such as going through the test with fresh eyes to see where we can get an extra point or two. The horses are jumping well so that is positive. We had a team dinner last night at our host's Carl Boukeart's home. It was a fun occasion with blindfolded canoe races before hand. I am happy to say that my teammate Karen and I prevailed. With Karen paddling and me shouting "left, now right, paddle harder!" it was a blast. We leave tomorrow for Kentucky - so I will have more to post then. I was really pleased with all of my horses during the dressage. It was a long hot day, but they all performed well with some room for improvement before the WEG. They are all a few points out of the lead of Allison Springer's Arthur who is on a good score of 35. The ground here in Georgia is pretty hard so I'm not running The Foreman, TruLuck and Woodburn, who have had good runs cross country in the past few weeks. 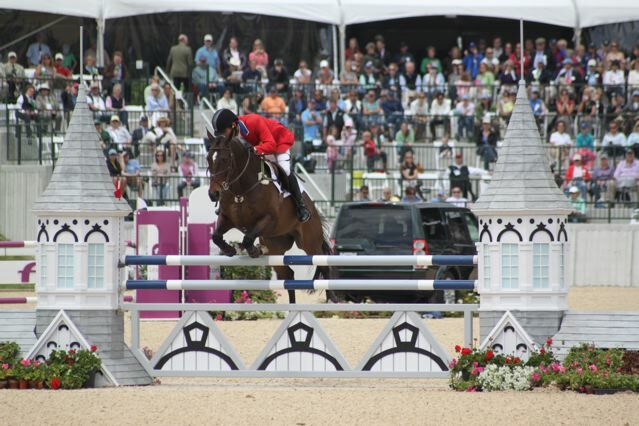 Fingers crossed for Connaught and Fernhill Eagle. I just arrived back from a long but successful weekend at Richland Park in Michigan. Those of you that followed this event would have noticed that most of the potential combinations for the US team ran here. Overall it was a great weekend for everyone. Three of my short listed horses ran at Richland, The Foreman, Woodburn and Kheops du Quesnay. All three were placed high up, so I was very pleased. I have to say I am very excited by the way The Foreman and Woodburn are going and went this past weekend. They each had three solid phases. So now we just have the AECs left to compete. This is a compulsory event for all the horses on the short list, so everyone will be there. The team is then named two days after the conclusion of the event, so fingers crossed until then! 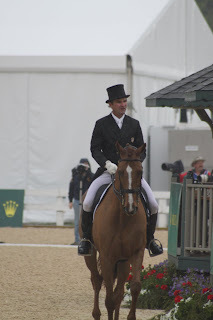 Just a quick blog to keep you posted on what the horses have been doing in between comps. 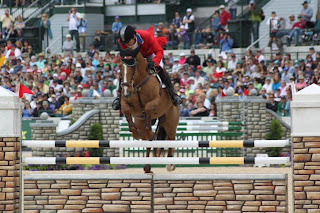 Last week I took TruLuck, Woodburn and The Foreman to the Culpepper show to work with Katie Prudent on their showjumping. It was a great experience for all of us and I think we made some good progress. 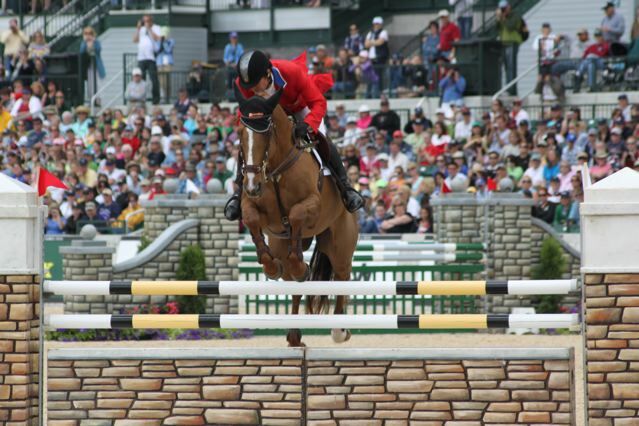 Katie is a great technician and it is always helpful to focus on the details of showjumping. Next, is Richland ... will post more after that event. Just returned from Florida where Woodburn and TruLuck have been in training with Oded Shimoni. I am very excited about their progress. They arrive back on Saturday and I can't wait to have them home. The Foreman and Connaught are back in work and progressing well. My first outing with these guys is taking TruLuck out to Rebecca Farm in Montana the third week in July. It is our first time going there and is really exciting. On Tuesday, Cosequin came up to the farm to film me giving some training tips. These will be short 30 second to 2 minute spots that will hopefully shed some light on basic horsemanship skills and solutions for riders of all levels. It was a perfect sunny morning for filming, with rain expected in the afternoon. Luckily we got all the filming done and my mount, Zanadoo, was really well behaved with the crew and their cameras (see photos below). Once all the editing is completed, Cosequin will be posting my training tips on their site, http://www.nutramaxlabs.com/. Make sure you check them out! This weekend, my two WEG hopefuls, Woodburn and TruLuck, will be heading down to Florida to work on their dressage with Oded Shimoni. I will be going down to train over the next few weeks, which I am looking forward to. Will keep you posted on their progress. Just completed the Jersey Fresh Three Day Event. 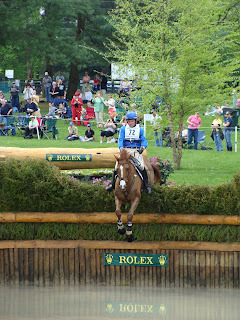 I had Jan Byyny's young horse, Inmidair (JR), in the CCI*** and TruLuck (Milo) in the CIC***. JR and I didn't get our act together that well in the dressage phase and received a score of 58. Things looked up from there with a good, fast cross country round on Saturday and a clean SJ on Sunday to end in second place to the exciting pair of Tiana Coudray and her lovely grey horse. 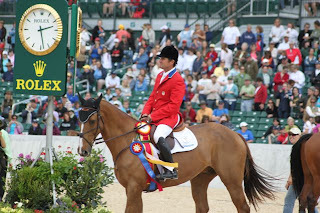 Milo won the CIC despite my rider error in the SJ which added 4 penalties to his score. 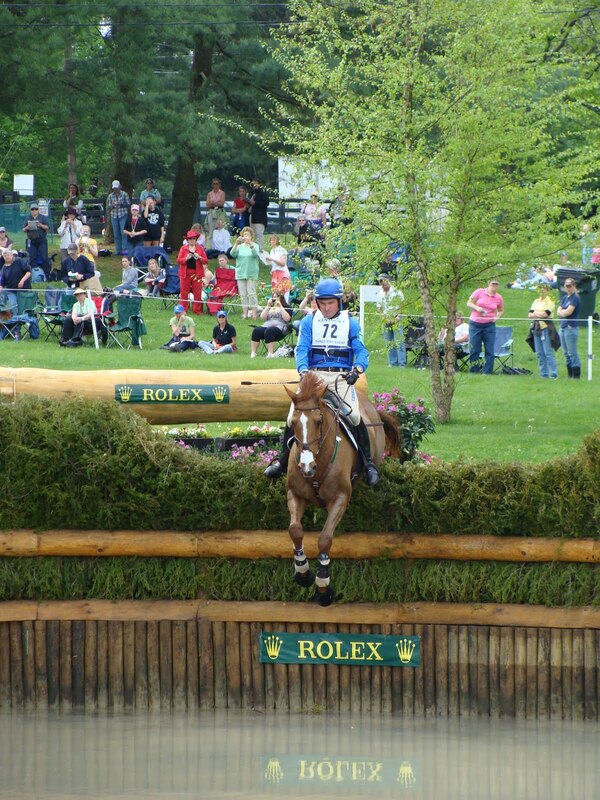 Both horses will have an easier time for a couple of weeks and then start the final build up to the WEG.